Man-made city in a swampy lagoon. Once the cultured metropolis ruled by Doges and oligarchic nobles. Center of commerce and the arts, home to Titian and Tiepolo, to Marco Polo and Coronelli. Galleys and merchant ships were sent to the farthest corners of the Mediterranean to trade and conquer. Wars were won and lost. A mesmerizing, intriguing and beautiful city characterized by its Palazzos lining the Grand Canal. 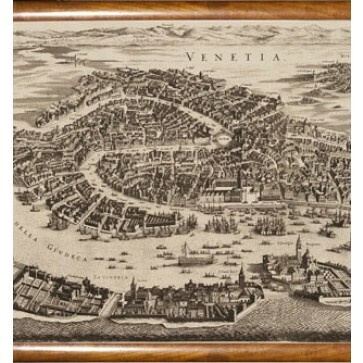 Enjoy our reproduction of 18th C. Venice, in birds-eye view, every house, alley? every canal? AM maps are printed on fade resistant, waterproof fabric. Cherry wood slats for hanging.